I finished a new hat today! Based off of this pattern: Robin’s Egg Blue Hat. 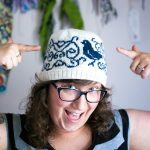 I’ve made three hats based on this pattern and they’re all so cute!